Caught smoking and drinking in the clubhouse. Gehrig smoked Camels - he endorsed the cancer sticks, believe it or not. He smoked a pipe as well. Don't judge him yet. First of all, the connection of cancer and tobacco wasnt mainstream in his day. Second, there was at least a sliver of shame he felt in smoking, because he tried to hide his smoking habit from certain circles. He was photographed in the clubhouse with a cancer stick in one hand and a longneck pressed to his lips by the other hand. 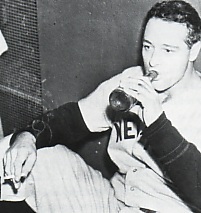 Gehrig admitted that he did not wait until he was celebrating his wedding night to learn the sexual side of life. Cursing and practical jokes were Gehrig mainstays. He posed for Tarzan beefcake pictures on the advice of his agent. Gehrig was ejected from a handful of games including one during his sophomore Yankee year when he naively reacted to Ty Cobb's characteristic taunts. In the 1938 season, when Gehrig was in an (at the time) inexplicable slump, he got bombed at the Yankee World Series victory party in Chicago. Overall, though, Gehrig had all the essential morals and virtues innately down pat. His work ethic translated into consecutive games, and it was his most noticeable virtue. His practically locked-shut wallet and his self-imposed vow of getting by on little was legendary. When he met Eleanor Twitchell, he fell immediately and forever in love with her. Partying, drinking, and painting the town, in general, were rarely on his to-do list. It can very well be said that he was a true, earthly god.